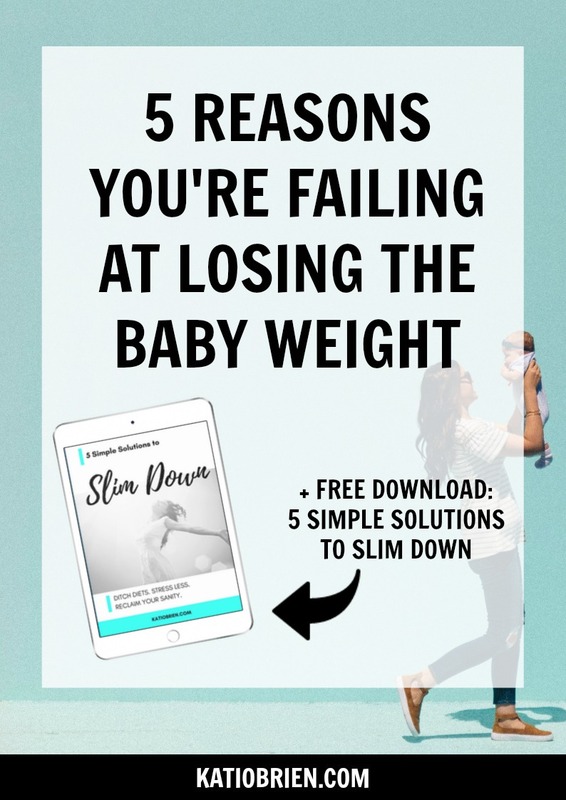 Since I feel like I’ve learned all of the things NOT to do when trying to lose the baby weight, I’ve decided to share 5 of them with you to hopefully save you a lot of time and struggle. As I’ve mentioned a million times, diets don’t work. Stop counting calories, obsessing over the scale, and please, please, please don’t try the newest trendy diet. You don’t need to go Paleo or start the Lemon juice cleanse. You don’t even need to exercise yourself to death. What you eat is important, but another quick fix diet is not the answer! The reason we binge, overeat, or eat emotionally is in direct relation to restriction and deprivation. When we restrict our calories or deprive ourselves of specific foods, it is our body’s natural biological response to crave and eat way more food than necessary. Our body is working hard to keep us alive and it goes into overdrive when it’s feeling deprived. So stop the restriction and deprivation immediately. For a long time I believed that I couldn’t lose weight because I lacked willpower. I just couldn’t seem to control what I was eating for more than a few days. But this is just a myth that the weight loss industry is feeding us. We do not need more willpower, we actually need to let go of trying to control the situation. You see, studies have shown that willpower is a limited resource and we are using our willpower all day long. This is why it becomes so easy to binge eat potato chips or chocolate cake late at night because our willpower is completely depleted. The other factor is that willpower will never beat out the emotional drivers behind our eating. It’s true. The way we talk to ourselves greatly affects the way we feel, act and therefore, the results that we get. Thinking “I’m so fat”, “I have no willpower”, or “I’ll never lose weight” will never get you the results that you are looking. It can be hard to stop this negative self-talk since we are so used to doing it. I recommend to start becoming aware of it, acknowledging it, and trying to remain neutral about the thoughts. Basically, it’s okay to have the negative thoughts come up, but try not to let them affect how you feel and instead just notice them with a sense of curiosity. Everyone’s heard the airplane analogy a million times “put your oxygen mask on before your children” but that’s because it’s so true. As moms, it can be so hard, but we must take care of ourselves before we can properly take care of everyone else. I promise you that I had the same struggle where I was constantly focused on taking care of everyone else and it lead to extreme anxiety and stress which made everything more difficult. Now that I make self-care a priority, I have so much more energy and I am able to be more present and happy with my family and friends. Now, I’m going to leave you with a loving reminder: This time of your life, while your children are young & small, is precious and amazing. Do you really want to spend it dieting and obsessing over how much you weigh?